The Ankeny Centennial meet at DMACC proved to be a beautiful day to start off the 2018 cross country season. The meet began with the Girls 9/10 race in which Johnston and Valley had a great team battle. 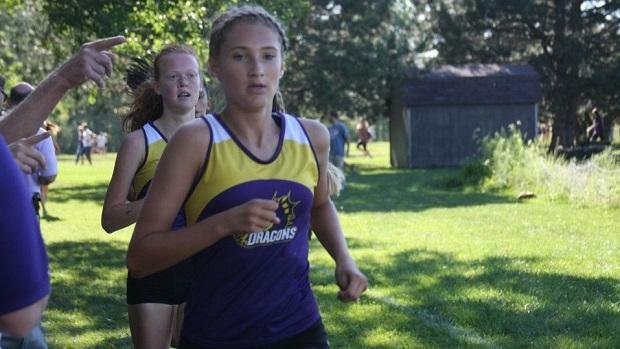 From the gun, Johnston's Bella Heikes and Faith Nead lead the way with a fast first mile. Valley's Lauren Schulze took over the lead around halfway through the 5K and ended up running away with the win in 19:17. Nead and Heikes finished in 2nd and 3rd respectively, with Aleah Tenpas also of Johnston in 4th clocking times of 19:49, 19:51, and 19:55. Johnson finished with a 9/10 team score of 29 points, followed by Valley in 2nd with 43 and Dowling Catholic in 3rd with 84 points. In the Boys 9/10 race it was a battle of the Ankeny schools right at home. Centennial's Gabriel Vicker cruised to the win in 16:17, with the next closest finisher Josiah Wittenberg of Pella in 16:53. Pella put up a close battle for 2nd against Ankeny with a score of 82 points, just 3 points behind the Hawks. Their team average times were also just 2 seconds apart with 18:42 and 18:44. Centennial took the win with 30 points with 1st, 3rd, 5th, 8th, and 13th places for their scorers. In the Girls 11/12 race Brooke McKee shined as the clear favorite. Many were concerned when McKee started off mid-pack, but by the half mile she led along with teammate Clara Toot and Dowling's Kate Timboe and Kelsey Schweizer. McKee took off with about a mile to go, leaving the pack behind and coming through the finish in an impressive 18:58, nearly a minute and a half faster than what she ran on the course last year. Timboe clocked 19:08 followed by Schweizer in 19:24 and Toot finishing in 19:38. Though Johnston's strength showed strong up front, they tied for 2nd with Ankeny Centennial and lost the battle on the 6th runner. Centennial's 6th runner finished in 23rd at 21:02 versus Johnston's in 43rd at 22:36. In the Boys 11/12 race Tim Sindt was the clear favorite from the get-go. As the returning State Champion, Sindt won by over a minute crossing the finish line in a blazing 15:27, just 14 seconds off of his PR of 15:13 and over 30 seconds faster than what he ran at this meet last year. Sindt led his team to a team win for the 11/12 category with a score of 36 points, followed by Valley with 56 points. Jonah Vicker of Ankeny Centennial and Tyler Kinney of Valley had a great battle throughout the race for 2nd, with Vicker running away with it in 16:40 versus Kinney's 16:46. Des Moines Roosevelt ended up with a strong team finish just 4 points behind Ankeny Centennial with 76 points. View the full results here and stay tuned for race videos and interviews from the Ankeny Centennial Invitational- only on Iowa MileSplit!